You will be surprised to know the nutritional value this green and leafy vegetable holds. Known by various names like green onions, onion sticks or salad onions, spring onions are not only taste enhancers but also contain nutrients of both onions and greens. The leaves of spring onions contains several important vitamins, anti-bacterial and anti-viral properties that help to treat viral infections, cold, flu etc. Also, if anyone suffering from arthritis or joint pain, eat spring onions regularly, as they help to lessen inflammation. The sulphur compounds present in spring onions help to reduce the risk of coronary heart diseases. Beneficial in gastrointestinal problems, spring onions are also great appetizers and are also helpful in the digestion process. I have tried this dish using a combination of Indian spices and Chinese sauces. • Wash and soak brown basmati rice for 30mins-1hr. Drain the water and set aside. • Boil enough amount of water in a heavy bottom pan and add in the drained rice and cook for 18-20mins / till the rice is cooked. • When done drain the water and with the help of a fork spread on the plate to cool completely. • Throw the roasted mixture into the mixer/blender jar and blend it to a smooth paste by adding some cilantro and set aside. • Heat oil in a saucepan add cumin seeds, spring onions saute for 2-3mins then add the blended masala paste, soya sauce, chilli sauce mix well and fry till the oil leaves the side of the pan. • Add cooked rice and mix well. Turn of the heat. Leave it closed for 5mins. • You can even cook the rice in the pressure cooker but it might be bit mushy. • As a healthy option I used brown rice you can use white rice instead. • Spices and sauces can be altered as per your taste. 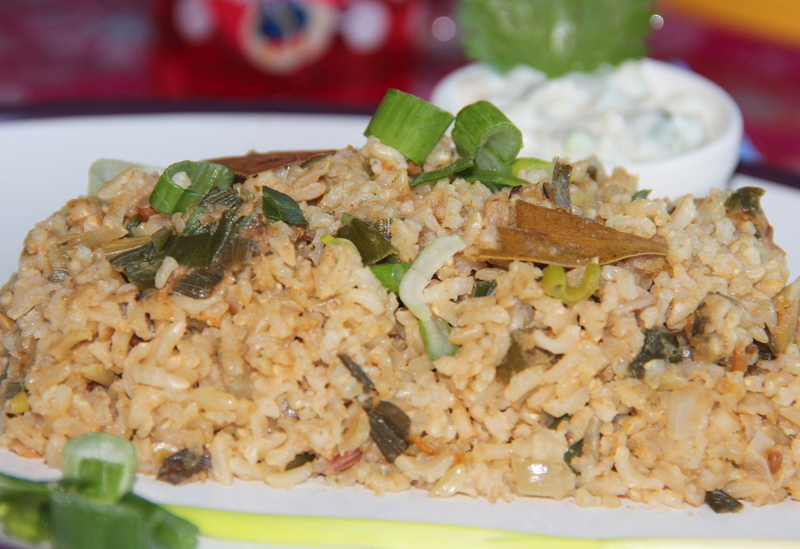 Posted on May 1, 2014, in Indian, Main dish and tagged drchdietfood, Fried brown rice, Indo-Chinese cuisine. Bookmark the permalink. 3 Comments. Hello, jսst ѡanted to mention, I loved this blog post. It was inspiring. Keep on ƿostinǥ!